TEDxAlger is one of the numerous TEDx conferences that emerged around the world in this last decade. They are inspired by TED conferences that stands for Technology Entertainment Design. Born in San Francisco and now famous worldwide, a TED conference is built under the spirit of sharing and spreading ideas, it brings together inspiring and charismatic individuals to share their innovative ideas in a well-defined theme through engaging and thought-provoking short talks. The licensed event of the famous TED conference was organised for the second time in Algiers on June the 15th. It showcased a range of inspiring and talented Algerian speakers and was themed “Positive Action”. The organising team, a group of young Algerian students and recent graduates, delivered the event with the ambition to have positive impact on Algiers. It is noteworthy to recall that the first edition of TEDxAlger which was themed “the entrepreneurship spirit”, took place in 2011 in the auditorium of the “Higher School of Computer Sciences” (ESI). This first edition proudly added Algeria to the prestigious list of countries that organise TEDxs and was the first TEDx conference in the country. The first TEDxAlger event was the initiative of a team of students from club ETIC, a student club at ESI that runs diverse cultural and scientific activities. In this second edition, a new team reiterated the initiative and decided to build on the previous edition by addressing an engaging and practical topic: “Positive Action”. After a fundraising campaign, the team successfully built the necessary logistics to meet the desired standards. Speakers from different fields were announced gradually during the promotional campaign of TEDxAlger. The scientist Abdenour Abbas, the humanist Nassima Dzair, the young activist Taki Eddine Djeffal and the famous Andalous musician Beihdja Rahal were among the first announced lecturers. Additionally, professor and researcher in management Taieb Hafsi, architect of earth materials Yasmine Terki, entrepreneur Mohamed Laid Benamor and journalist Soraya Kheireddine, joined the crew. Last but not least, young entrepreneur and coach, Amira Hamdad, consultant and strategist Adel Haddoud and education specialist Leah Bitat, closed the announcement campaign. The event’s agenda was divided into sessions labelled: Understand, Grow, Accomplish, and Persevere; four action verbs which express a natural cycle for a positive initiative. Each speaker was allocated to one single session that best fit their talk. The first session started with Mrs Terki’s talk which expressed her passion for earth architectures and the importance of promoting the earthen architectural legacy. Right after that, Mr Hafsi described the imprinting concept and its possible application to the Algerian society. The third Talk of the session featured Mrs Bitat, whom after talking about her experience, analysed the educational systems and the importance of creating an educational environment that answers the current needs. In the second session “Grow”, the scientist Abdennour Abbas shed some light on the general concept of innovation and its relationship with the growth and development of society. Then, Nassima Dzair a young activist shared the lessons and philosophies she learned through her journey and various humanitarian activities. Soraya Kheireddine shared her “12 goals” project which revolved around achieving a personal objective per month: teaching, organizing an exposition with the audience and invited each one of them to live up to their dreams while having a positive impact on communities. The lunch time break was followed by the third session, where Addel Haddoud talked about how important it is for every young entrepreneur and researcher to seek knowledge and opportunities at both local and international levels, bringing the talents up by a simple process of “tsamat bel mla7a” which can be translated by “insisting in a persevering way, yet nicely and politely”. The following talk, by Taki eddine Djeffal, a young student and activist who addressed the importance of the human element in designing and overseeing the growth of any project. The last speaker of the session, Amira Hamdad, developed the cropping concept which engages everyone to see the best in the whole picture in order to achieve “CARAT” objectives: which can be translated by concrete, ambitious, realistic, undertaken and temporal. The last session which was dedicated to perseverance, started with a moving speech from the entrepreneur Mohamed Laid Benamor, who shared his astonishing story which was full of obstacles, and how success comes through perseverance. To conclude the day, the famous chief orchestra Beihdja Rahal shared her experience and the importance of rigor and hard work in music education, emphasising the role of women in the Andalusian music industry. The diverse sessions were embedded with musical pauses by the famous Nassim Djezma whose performance of Romaissa and Billy Jean energised the audience. The second edition of TEDXAlger would not have been a success without the devotion of a team of volunteers, who was in charge of the whole theatre and event preparation. The initiative of bringing together the organising team composed of 16 people and the 50 TEDx volunteers, allowed the group to build a diverse and effective management team. The process of including volunteers allowed people from Algiers to embrace and own the event that belongs to everyone. 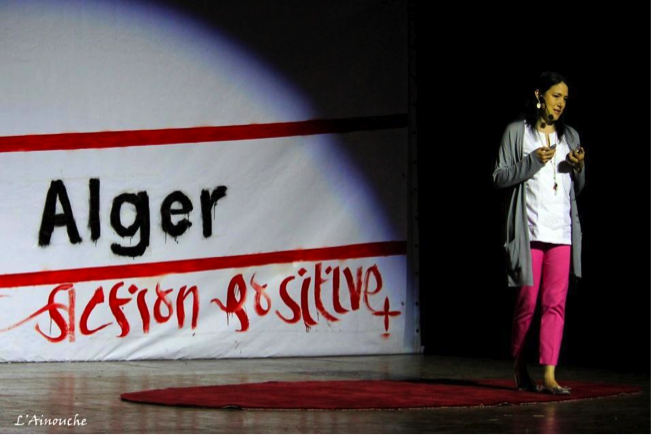 This second edition of TEDxAlger was also highly anticipated. The challenge was all the more important to address, knowing that the expectations of the public’s interest in this concept has been growing fast, driven by the quality of the different TEDx events that succeeded in Algeria. We can name as examples TEDxAnnaba in 2012 themed “sharing 2.0”, TEDxEpau in 2013 which focused on architecture and TEDxChréa, which focused on the environment. Several social media based competitions, plus a subscription process allowed the interested public to win tickets to attend the conference. The TEDx community in Algeria showed a great interest in the event by subscribing to get invitations in a record time of 55 seconds for 120 invitations. More than 700 people attended the conference and spent the whole day listening to and debating the talks and their possible implementation in the Algerian environment. The pictures of the D day are available on the official Flickr account. The event was deemed a huge success both during and after the conference as it has been heavily followed on social networks such as Twitter where the #TEDxAlger Hashtag has been first Tweet trend in Algeria and in France, but also a worldwide tweet trend for the day. The TEDxAlger is then the second time ever that an Algerian event is found on the world trend, after #EinAminas event. The organizing team was surprised and touched by the trust and enthusiasm of the attending public. We hope that the ideas shared during the talks would be etched in everybody’s memory, and that Algiers will be a hosting venue for more and more initiatives directed toward ideas sharing and positive impact. Neila Zerguini, co-organizer of the TEDxAlger 2013, is a computer science engineer. She graduated from the “Higher School of Computer Sciences” in Algiers, specialising in information systems. 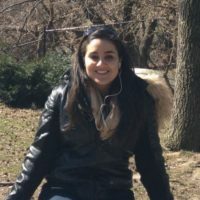 She is now a Master of Science student at HEC Montreal focusing on business strategy.